It’s times like these that I’m glad I can read Spanish and French; speaking it is another matter entirely! This morning, I got an alert from a friend about Digicel El Salvador and their latest Promotion involving Postpaid, smartwatches and the DL910. 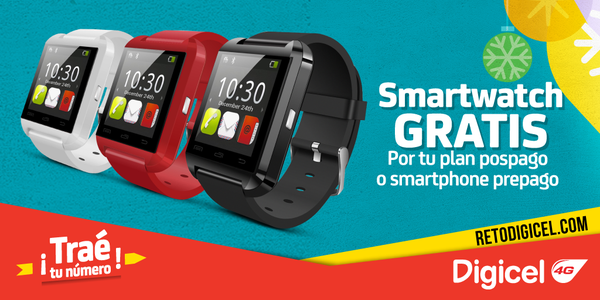 Digicel El Salvador is giving away a free smartwatch to customers who subscribe to a US$15 per month or higher Postpaid plan or purchase a pre-paid smartphone costing US$99.99 or higher. Not only that, but they also get double the Gigabytes for their Mobile Internet plan! I scoped out Digicel El Salvador’s Twitter account @digicel_sv, Digicel El Salvador Facebook as well as on Digicel El Salvador Website and it appears my tipster was spot on! Turns out they’re giving away smartwatches with the sale of a Samsung Galaxy J1 as shown below. It’s gifted to the customer once they purchase their smartphone on a Prepaid or Postpaid fan. Finally some love for Postpaid customers! If you purchase the Digicel DL910, you’ll also get along with the smartwatch US$100 and 1 GB Free Data. No wonder Digicel loves El Salvador!!! But wait, if you buy a Samsung Galaxy S6 Edge, you get double the 12 GB of Data which works out to be about 24GB, once you purchase it on a Postpaid Plan! Samsung it seems, is befitting from an association with Digicel as well as FLOW Jamaica as pointed out in How Flow Jamaica Merry Up Christmas promotion plans to Awaken The Force. At this point as a Jamaican this seems a bit unfair!! Here in Jamaica, Digicel’s Merry Million Promotion, which revealed the DL910 as noted in Digicel DL910 revealed in Merry Millions Promotion, is churning out millionaires every week. The 3rd millionaire so far was Golda Mair as shown in the following YouTube video on Digicel Jamaica’s YouTube page. You can scope out the other winners on Digicel Jamaica’s YouTube page as they post them weekly!! I scoped out Digicel Jamaica’s Twitter @DigicelJamaica account for more clues. Digicel Jamaica seems to be focusing only on getting more Jamaica to sign up to a Postpaid GoSMART plan in exchange for a free smartphone. Enjoy this exclusive offer TODAY! They also have a #SocialMillionaire Promotion where you take crazy smartphone selfie-photos and post them to Facebook, Twitter or Instagram via http://socialmillionaireja.com! Still, this isn’t so bad. But it still looks as if Jamaica is seen in a lesser light by Digicel. Especially as the Eastern Caribbean has the DL755, the DL810, the DL910 and now the DL1000 while Jamaica only has the DL910 as noted in Digicel launches DL1000 in the Eastern Caribbean. But smartwatches are another thing entirely! Aside from Samsung, hardly any electronics stores are selling smartwatches in Jamaica. Had this offer come to Jamaica, it would help to jump-start the trend of smartwatches among our smartphone toting population! Digicel, when are you planning to sell smartwatches such as the Samsung Gears S2 as described in Samsung Galaxy Gear S2 has Tizen OS powered Samsung Pay Winning Potential in Jamaica? Perhaps 2016 will bring these and other Gadgets along with the Easter Bunny in March 2016!